The first adventure game in years since The Last Express that is really a non-linear adventure game. The order of your action and the conversation path you choose will determine the way Gus solved the case. There is no dead-end at all within this game. Each problem will have at least two ways to solve it. Do not worry if suddenly an inventory item, that you thought will help you solving a problem, disappeared after doing an act. You will be able to find different way to solve that problem. This is a brilliant approach on solving a puzzle. Hopefully more developers will do the same thing for their future adventure games. There is one very tough Pixel Hunting puzzle in the game. You need to have patience to solve this one since a walkthrough is not good enough to solve it. Beside that tough puzzle, all the puzzles in the game are easy or moderate. The graphics in the game are a top notch graphic (even though is not as good as Syberia, the previous game from Microids). There is only one bugs of the game that I encountered when I played this game. The voice of the characters overlapped each other during the conversation. I don't know if I could considered this as a bug though, since it only applied to gamer that play this game on a laptop (specially on any Dell laptop). You need to set your graphic bit into 16-bit and TURN OFF all other applications on the background, such as screen saver or any other program. Sometime, you still have to restart the laptop even though you have done all the things mentioned above. Overall this is an A rated adventure game that will stick on the back of your mind for a long time. You play as Gus Mc Pherson, a American Private Investigator, who has been living in Paris as an artist. Sophia Blake asked him to investigate the murder of Ruby and Regis Whyte, a mysterious American couple, who were found dead in their hotel room, at Hotel Orphee. As usual, I will give freedom to you to choose your path since I only tell you the solution based on the question not by step-by-step walkthrough. Even though I try to place these questions in certain order so that you could understand how the story unfold. All important clues needed for a perfect ending will be marked with green color. You need to collect or at least know about this clue to be able to provide a complete evidence to Inspector LeBreun for the final conversation with him. This will determine how the ending will be. Q: What should he do with Sophia's request? A: He could either accept the offer at his studio right now or at the Chez Alexandre restaurant later on. No matter what he does, he will accept the offer in the end. The only different is that he will have access to the restaurant earlier. In any case, he will learn that Inspector Le Breun is the person in charge of the case and will gain access to the Police Station. Call Pinkerton agency, his former New York office, after she walked out of the door to do background check. The result will come later on. Make sure you check the door mat every time he enter his studio. Q: What kind of information could Gus collect at Hotel Orphee? A: Not much at this time. Depends on which character you choose to tell Petit, the front desk, Gus could have an early access to the second floor. He could immediately talk his way to the second floor as an Insurance Agent or he has to squeeze his brain to sneak to the second floor as other professions. As for information, he will learn a little bit about the night of the murder from Nicolas (the bartender) and Petit. Q: It is time to go to the police station. How could Gus get a hand on the murder report? A: Pay attention to the conversation between the police and the woman. She asked about her missing son, Hellouin. Gus needs to bribe the police. As a PI, Gus will learn that the police needs something to quench his thirst. Buy a red wine from Nicolas, the bartender at Hotel Orphee. Give the wine to the police and he'll give Gus the police report. Gus will learn about the witnesses' words and the mysterious person's description from the report. There is one key witness, a woman who stay in the room across from the room 507. Gus needs to have a special item to be able to talk to Inspector LeBreun. Q: Where could he find more information on the mysterious person on the police report? A: Go inside the hotel's cafe and talk to Nicolas, the waiter. He will mention about a stranger who sat near the window before the murder happened. He will also tell Gus that Malet, the hotel porter, had a brief conversation with him. From his information, Gus will have access to Alambic Bistro, a local club in Paris where Malet used to hang around. Nicolas and Petit will give additional character description of the stranger. Q: What does the mysterious person look like? 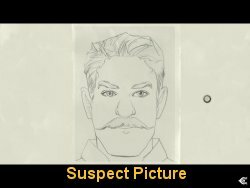 A: He has boxer nose, short straight hair, thick moustache, square face, flat ears, large mouth with thin lips and small sharp eyes. Look at the picture on the right to help you. Show this picture to Nicolas for confirmation. Q: Where could he find Malet? A: Use the map to go to Alambic Bistro. He could find Malet talking with Hulot, the owner of the club, near the bar. Show the picture to Malet. The suspect will walk into the club. Malet will run away and so does the suspect. Gus will chase him out. Unfortunately he could not catch him. Q: Who is this mysterious person? A: Go to the police station and show the picture to police. He will go to the back room and talk to LeBreun. Gus will overheard the conversation about Hellouin. Gus could visit Hellouin's office now. Too bad the door to his office is locked. Need to find a way to unlock it. Q: How could Gus gain access to the second floor of Hotel Orphee if he told Petit that he is a Journalist or Private Investigator? A: Isidore Petit will refuse to talk to Gus if he lies as a Local or Foreign Journalist or if he tells the truth as a Private Investigator because of the hotel's security policy. Fortunately, he will be able to gain access to the second floor by climbing into the big luggage cart close to the main staircase. The bad news is that the door to room 507 is locked also. Now we have two locked doors blocking the investigation. Q: What should he do now? A: He could either walk into Room 506 or he could just start walking away toward the staircase. If he walk away, the woman from Room 506 will call him back. So either choice will bring Gus to Room 506 in the end. Choose any conversation you like, it will not affect any investigation path. The information from the woman will add the complexity of the case. She will give Gus a magic talisman. Special Note: If you choose to investigate Hellouin's office first and do Hellouin's Act before going to the second floor of Hotel Orphee, Gus will have an opportunity to pick up a pencil from the reception desk down stair. If he does that then Mrs. Louiseau will not give him a magic talisman. Since both the pencil and the magic talisman will have the same function on this game. Q: Where could Gus find a lock pick? A: Try Hulot, the manager of Alambic Bistro. He knows a lot of people from the underground, so finding a lock pick will not be a problem for him. Hulot will give Gus a lock pick in return for his service. Gus needs to find the differences between the original and the duplicate painting. Q: Gus now has a lock pick. The bad news is that he could only use it once. Which door needs to be unlocked with the lock pick? 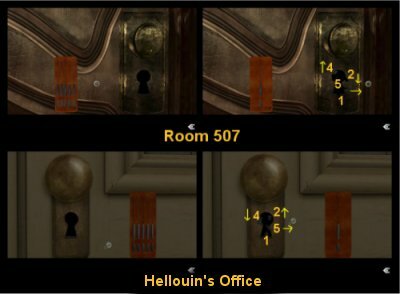 A: Both locked doors (Hellouin's office and Room 507) have two different ways to unlock them. Q: How could Gus unlock Room 507? Journalist or PI: The door to Room 505 will be found open after you did Hellouin's part. Gus will be able to enter Room 507 through connecting door between Room 505 and 507. Gus will be able to get the key through the gap below the door. Slide the newspaper under the door. Use either the pencil or the magic talisman to poke the key through the keyhole. The key will fall on the newspaper. Grab the newspaper back. Use the key to unlock the door. Insurance Agent: He will be able to enter Room 507 through the connecting door between Room 505 and 507. Gus will be able to get the key through the gap below the door. Slide the newspaper under the door. Use either the pencil or the magic talisman to poke the key through the keyhole. The key will fall to the floor. Grab the newspaper back. Use the key to unlock the door. Q: How could Gus unlock Hellouin's office? A: First, he could unlock it using the lock pick. Use the picture above to help you unlocking the door (lock pick 1- 5 is from left to right). If Gus used the lock pick to unlock Room 507, he should be able to find a mallet near the toolbox in front of the broken elevator at Hotel Orphee. Use the mallet to break the glass above the door handle. Gus will be able to unlock the door through the hole. Q: What could Gus find inside Room 507? A: He should be able to grab the glass shard with strong ether smell on the foot of the bed and a ring with a word 'Fay' imprinted on it inside the fireplace. Look at the lower left corner of the fireplace to pick up the bracelet. Gus might be able to pick up a strongbox key on the right nightstand beside the bed (depending on the order of Gus' investigation - if you choose to do Hellouin's Act below before entering Room 507). Enter the bathroom and notice the black hair dye on the sink. Strange, does not Mrs. Whytes have red hair not black? Q: What could Gus find inside Hellouin's office? A: He could find a locked safe on the bottom drawer and an appointment letter from Gregoire de Allepin inside the top drawer. The bottom drawer will trigger the cutscene of Mrs. Hellouin enter the room. Tell Mrs. Hellouin that Gus is a friend of Hellouin and he just want to help Hellouin. She will take Gus to see Hellouin in the attic. Q: What should he do first? A: Try to make an inquiry call to Gregoire de Allepin about the contract. Too bad there is no answer. Visit Eaton's apartment. There is an old lady working on the floor. Try to get Eaton's apartment number from her. Hellouin could get some valuable information from her. If you choose the correct conversation path, Hellouin will be able to have access to Alambic Bistro. Do not worry about it though since he could have access to his place through other mean later on. Q: How could Hellouin enter Eaton's apartment with this lady blocking the way? A: Enter the yard and pick up the red ball on the ground. Throw the ball to the red vase on the window. This act will trigger a cut scene showing the old lady walking toward the yard. Sneak up to the second floor and enter Eaton's apartment. Q: What could be found inside this apartment? A: He could find several important things here. 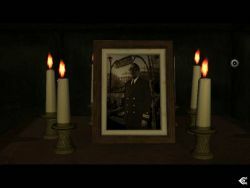 The boat ticket from New York to Le Havre on the dresser and a locked strong box inside the closet inside the bedroom, Dr. Kauffner's business card and also the note from Brotherhood of the Secret Order of the Rose Chapter on the cabinet inside the dining room. The note will explain the role of Fay as Adeline, the long lost love of Gregoire DeAllepin. Notice Hulot's exposition poster above the cabinet. He will gain access to Alambic Bistro by looking at the poster. You will not be able to find the key to this box until later on. Q: Where could Hellouin find the Eaton? A: Visit Dr. Kaufner in his office. Hellouin could gain several important information about the Brotherhood, Gregoire de Allepin, and the Eaton. Ask the police at the police station about the Eaton. Visit Alambic Bistro and talk to Berenice. She will tell him that the Eaton are trying to make a scam of the century with Hulot's help. Hulot scribbled the address of the meeting place with the Eaton. There are 2 ways to find te address: go to the bar counter and use the pencil on the note to reveal Chez Alexandre address or visit the Hall of BSORC and choose any conversation path. In the end, the door man will give Chez Alexandre's address to Hellouin. He said that the restaurant is the place in Paris to find the Eaton. Q: The Maitre D at the restaurant does not recognize the Eaton. How could it be? A: The only American couple on the reservation list is the Whytes. Choose any conversation path as you like. In the end, the waiter will refer him to Hotel Orphee. Ask Petit about the couple. He will refuse to tell Hellouin about them because of the hotel's policy. As soon as Hellouin start to walk away from the hotel, one of the porter tapped his shoulder. Walk to the cafe Nantis. He could talk to the bartender if he like. Walk to the table near the window. Theo Malet, the porter, will walk inside and sit in front of him. Ask Malet about the Eaton. Watch the cut scene on how Hellouin discovered the gruesome murder of the Eaton. Inspector LeBreun will show up and arrest Hellouin. Back to Gus. A: If you have not visit Room 507, do so now. Gus could talk with Petit and Nicolas at Hotel Orphee to learn that Malet has been murdered. Visit the Eaton's apartment. Go inside the bedroom and notice the locked strong box in the closet. Q: Where is the key to unlock this strong box? A: If you choose to unlock Room 507 before doing Hellouin's Act, Gus will be able to find the key behind the bottom left corner of Hulot's exposition poster. Other wise, Gus will be able to find the key on the nightstand in Room 507. Unlock the box and pick up the passports, picture of the Baphomet, and Sophia's Blake letter. What is this? Is Sophia Blake try to take advantage on Gus? Q: Who is Sophia Blake? A: Go back to the studio. Pick up the telegram on the door mat. Hmm.... Blake only has one daughter. Sophia has lied to Gus about the Whytes. Use the phone to call Sophia and agree to meet at Chez Alexandre. Learn more about the couple and the head of the Baphomet story. So this is the main subject of the murder: the Head of the Baphomet. Gus will have an access to the Meeting Hall of BSORC. Now, Gus will have multiple options, he could go to Meeting Hall of BSORC or DeAllepin's house. Q: Gus went to the Meeting Hall of BSORC but the door man did not allowed him to enter. What should he do? A: He needs to have an introduction letter from the member of the organization. Visit Alambic Bistro. Ask Berenice to forge you a fake introduction letter based on the letter from Hellouin's office. Unfortunately, the door man at BSORC does not recognize the hand-writing of the letter. He needs to find another hand-writing of a member to forge. It is time to visit our friend: Gregoire DeAllepin. Unfortunately, his house is locked tied with a strange lock. Once he found out the DeAllepin's monetary reports, quickly go back to Berenice before doing anything else. Once Hulot found dead, Berenice will refuse to forge another false document for Gus. Note: As I mentioned above that there is always more than one way to solve a puzzle. There is another way to enter this BSORC Meeting Hall if Berenice refuse to forge Gus another fake letter. Q: Where is the key to DeAllepin's house? A: Dr. Kaufner might have it. Visit his office. Hmm.. nobody is here. Gus just need to find a way to enter his room. Q: How could Gus find a way to enter Dr. Kaufner's office? A: Notice the far end door in front of Gus. That is Dr. Kaufner's office. Go through the left hallway. Pull up the level on one of the corner. This act will close door behind him and open the one in front. Continue down the hall and pull up another lever. Go through the open hallway. Notice the door behind the locked grate on the left. That is Dr. Kaufner's office. Continue down the hallway. Pull up another lever to close the door behind him. Continue through the open hallway and pull up another lever. This will open the hallway in front of Gus. Go down the hallway and notice that Gus back at the starting point. Turn right and enter the hallway. Gus will see Dr. Kaufner's office behind a locked grate in front of him. Turn left and pull down the lever. Go forward and pull down the next lever. This will open the grate in front of Dr. Kaufner's office. Go to the starting point and turn left. Enter his office. Q: What kind of stuff could Gus find inside Kaufner's office? A: Pick up Gregoire and Gracie Eaton's medical reports from the bottom right drawer of his desk. Get Kaufner's journey on the top of his desk. There is an egg close to the journal. Click on the button to open the egg. Pick up an interesting wax cylinder. Check out the small table on the corner of the room. Get the hypnotize necklace. Now for the key to De Allepin's house. This key has 4 different parts with four different colored diamond shapes. The first part is on the small table, near the necklace. The other three parts of the key are on the three bookshelf in the room. Q: Where could Gus play the wax cylinder from Kaufner's office? A: Go to Hotel Orphee and visit our friend in Room 506. She has a record player inside the room. Insert the voice cylinder and play it. The wax cylinder contains Gregoire DeAllepin's therapy session. The guy is a nut case. Q: Gus unlock Allepin's house with the four keys. Where could he find a hand-writing sample inside this big place? A: On the second floor, he could find frescos of the Knight of Templar story on the far end of the wall. To the left of this frescos is Allepin's study and to the right is his bedroom. Gus could find Adeline photo inside the bedroom. Get DeAlleppin's monetary report on the desk. The hand-writing is difference. How can it be? Gus needs to investigate this house thoroughly. There is a foul-play going on here. At the other end of the room, Gus will find a strange planetary display with a panel below it. Q: What does this planetary display do? A: It is a mechanism to open a secret chamber in this house. Look closely to the writing below each fresco in the hall. The date on the plate is the key to operate the mechanism. Enter all three dates in any order you want. After the last date entered, the wall on the left will be opened. Gus discovers the secret pathway to the secret chamber. 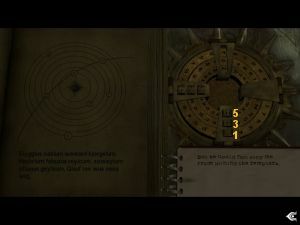 Enter the chamber and Gus will see a set of alchemy apparatus and a strange book with a coin imprinted on it. Gus could solve these two puzzles in any order, but beware though. Once he solved the strange book puzzle, he will be transferred automatically back to his studio by a cut scene. So make sure he has inspected every corner of this secret chamber before tackling the book puzzle if you do not want to go back and forth to this secret chamber. 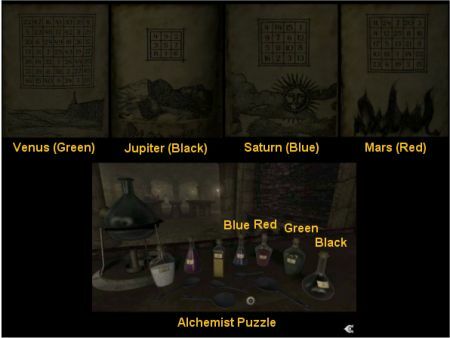 Q: What is the solution of the alchemy puzzle? Use the measuring spoons to get the appropriate amount of the powder and drop it on vial that sits on the top of the burner. Light the burner with the matches. Gus should have a purple vial in his possession if he did it correctly. Do not forget to pick up the 18th Century Gold Coin on the table also. Q: Where is Gregoire De Allepin? A: Go deeper to the crypt. Gus will see a dead body lying on the tomb. Could it be .... Yeah, this is the dead body of Gregoire De Allepin. Use the camera to take a picture of his dead body. If Gregoire has been died all this time, who has been acting as him lately? Dr. Kaufner!!!!! Q: What is the solution of the book puzzle? A: Get the metal ring from the bookshelf across the secret chamber entrance in the study room. Pick up the knife beside the book. Look closely at the book. Place the ring on the slot and clamp down all the four clamps. Set the top clamp to display A, D, and N from top to bottom. Set the bottom clamp to display 5, 3, and 1 from top to bottom. Leave the left clamp alone. Gus will see be able to read the history of the Head of The Baphomet from the book. Gus will end up back in his studio again. Pick up the ransom note that just come on the door mat. Kaufner kidnapped Sophia Blake and wants the Head of the Baphomet in exchange. Q: Where could I find The Head of the Baphomet? A: Visit Alambic Bistro. Berenice will tell Gus that Hulot has been murdered. Learn that Berenice has made a imitation of The Head of The Baphomet for Hulot. Dig more information from her until she said that Hulot has been sitting in front of his fresco every night. There should be something special about the fresco. Go to the back room of the club and notice a set of candle has been lighted in the memory of Hulot. Look closely at the picture and pick up the candle. Notice the arch behind Hulot on the picture. Step to the right of the fresco on the wall and look closely at it. If you has talked with Berenice up until the detail of the Baphomet and Hulot's new habit at night, the candle should be lit at this point. Welcome to the new breed of PIXEL HUNTING puzzle. 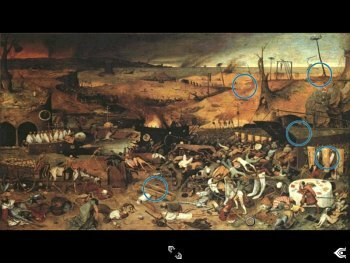 Gus need to find several hidden images on the fresco. Once he found all of those hidden images, he will be transferred automatically to his notebook. He could form the same arch from the Hulot's memoir picture on his notebook. 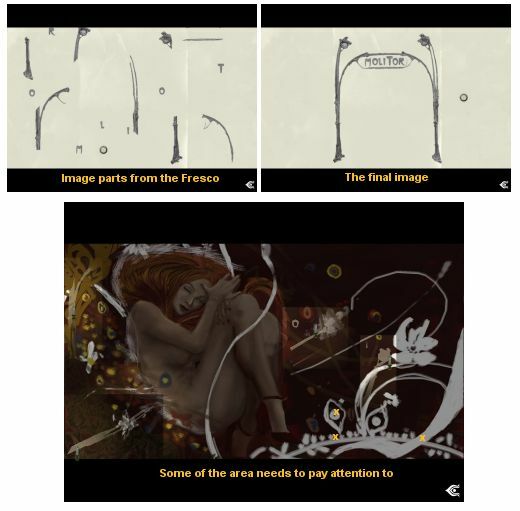 Pay extra attention on the bottom right and left area of the fresco because almost 70% of the parts are there, including almost all the letter images. Q: Where inside this train station that he could find the Head? A: Go to the far end left tunnel. Gus will be surprised by a train. He will jump through the left opening to a dark passage way. A: Use the candle or the flash light from Hellouin's Attic (in his office) to light his way if the candle does not work. Proceed to the end of the passage until he could pick the false Head of Baphomet from the shelf and the original Head of the Baphomet one from inside the box on the floor. Q: Berenice refuse to forge Gus another false document. How could he enter the Meeting Hall of BSORC? A: Use the purple vial from DeAllepin's secret chamber to drugs the door man. Unfortunately, the door man does not have anything valuable on him. Proceed to search the Hall. Q: What could he find inside this Hall of BSORC? A: Go to the inner library. Pick up the journal on the table, the book about the Knight of Templar inside the far right end bookshelf, and the brass coin from the left glass display. Q: What other information he needs to help Hellouin? A: Go to Hotel Orphee again and talk to Nicolas about Hellouin and Malet. Go to the second floor and exausts all the conversation topic with the lady in Room 506. Gus will learn a lot about Knight of Templar, The Head of Baphomet, and The Alchemy Knowledge. Q: How could Gus convince LeBreun that Hellouin is innocent? A: Gus needs to collect or know about all of the items marked with green color above. Once he did that he could exhausts all conversation topic with Lebreun until LeBreun called Hellouin for a talk. Gus will provide information on Ring, Passport (or Sophia's Letter), The Murder of Malet and Hulot, the letter from DeAllepin to Hellouin, Nicolas testimony that he saw Hellouin and Malet together on the night of the murder, De Allepin's Photo, The Knife, The Brass and The Gold Coins and The Purple vial (if he did not use it for something else). There will be an option for Gus to say that he hoped all of these evidence are enough to prove that Hellouin is innocent. Q: Where is Sophia Blake? A: Go to DeAllepin for the final confrontation with Dr. Kaufner. Choose to destroy the Head of Baphomet (it's a false one anyway) for a happy ending or return it to Dr. Kaufner for a sad ending.